Fear. Sacrifice. Contact. This is awesome. Our favorite sci-fi blog io9 has debuted an impressive poster for Europa Report, the indie sci-fi about a mission to Jupiter's moon, Europa, where they're searching for life in the oceans. The film is apparently going to be presented entirely found footage, as was teased in the first trailer and footage late last year. The poster plays on that with some grainy visual static like the photo was decoded from video. The image itself is just a gorgeous shot of single astronaut walking towards the gigantic frozen ocean ice formation, with Jupiter (and their ship) looming above. It's simple, but a powerful image, and I love how much it conveys in just one beautiful image without the need for floating heads or huge text. "For decades, scientists have theorized the existence of liquid water oceans on Jupiter's moon, Europa. We've recently discovered new, captivating evidence that these sub-surface oceans do exist and could support life. We've sent six astronauts from space programs throughout the world on a three year journey to Europa to explore its oceans and confirm these findings." The international cast includes Sharlto Copley, Michael Nyqvist, Anamaria Marinca, Christian Camargo, Daniel Wu and Karolina Wydra. 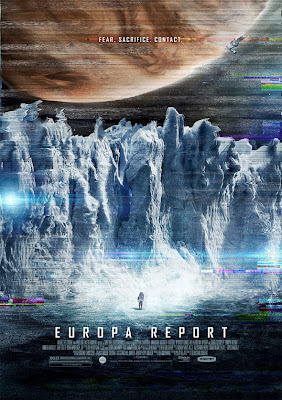 Europa Report is directed by Sebastián Cordero, from a screenplay written by Philip Gelatt. Magnet Releasing has the film scheduled for release VOD June 27th and in theaters August 2nd this summer. Teaser trailer. Thoughts?